In this lesson, we will learn how to calculate the power of a moving body given that its motion and the force acting on it are represented in vector notation. A particle is moving under the action of the force . Its position vector at time is given by the relation . Find the rate of the work done by the force at . A particle of unit mass is moving under the action of a force ⃑ 𝐹 = − 2 ⃑ 𝑖 + 4 ⃑ 𝑗 . Its displacement, as a function of time, is given by ⃑ 𝑆 ( 𝑡 ) = 2 𝑡 ⃑ 𝑖 +  7 𝑡 + 2 𝑡  ⃑ 𝑗 2 . Find the value of 𝑑 𝑑 𝑡  ⃑ 𝐹 ⊙ ⃑ 𝑆  when 𝑡 = 4 . A body of mass 3 kg moves under the action of a force ⃑ 𝐹 N. At time 𝑡 seconds, the velocity of the body is given by ⃑ 𝑣 =  ( − 4 − 2 𝑡 ) ⃑ 𝑖 + ( 5 − 2 𝑡 ) ⃑ 𝑗  / s i n c o s m s . Find, in terms of 𝑡 , the power of the force, ⃑ 𝐹 . A body of mass 17 kg moves under the action of a force ⃑ 𝐹 . Its position vector at time 𝑡 is given by the relation ⃑ 𝑟 ( 𝑡 ) =  7 𝑡  ⃑ 𝑖 +  4 𝑡  ⃑ 𝑗 3 2 . Given that 𝐹 is measured in newtons, 𝑟 in metres, and 𝑡 in seconds, write an expression for the power of force ⃑ 𝐹 at time 𝑡 . A particle of mass 4 g is moving under the action of two forces ⃑ 𝐹 1 and ⃑ 𝐹 2 , where ⃑ 𝐹 =  6 ⃑ 𝑖 + 3 ⃑ 𝑗  1 d y n e s and ⃑ 𝐹 =  3 ⃑ 𝑖 + 4 ⃑ 𝑗  2 d y n e s . The position vector of the particle is given as a function of time by ⃑ 𝑟 ( 𝑡 ) =   𝑎 𝑡 − 8  ⃑ 𝑖 +  𝑏 𝑡 + 1  ⃑ 𝑗  2 2 c m , where 𝑎 and 𝑏 are constants. Determine, in ergs per second, the power at which the resultant force acts on the particle 8 seconds after the start of motion. A constant force ⃑ 𝐹 , measured in dynes, is acting on a body. The displacement of the body, after 𝑡 seconds, is given by ⃑ 𝑟 ( 𝑡 ) =  2 𝑡 ⃑ 𝑖 + 3 𝑡 ⃑ 𝑗  2 c m , where ⃑ 𝑖 and ⃑ 𝑗 are two perpendicular unit vectors. Given that the force ⃑ 𝐹 was working at a rate of 35 erg/s when 𝑡 = 2 , and at 43 erg/s when 𝑡 = 4 , determine ⃑ 𝐹 . 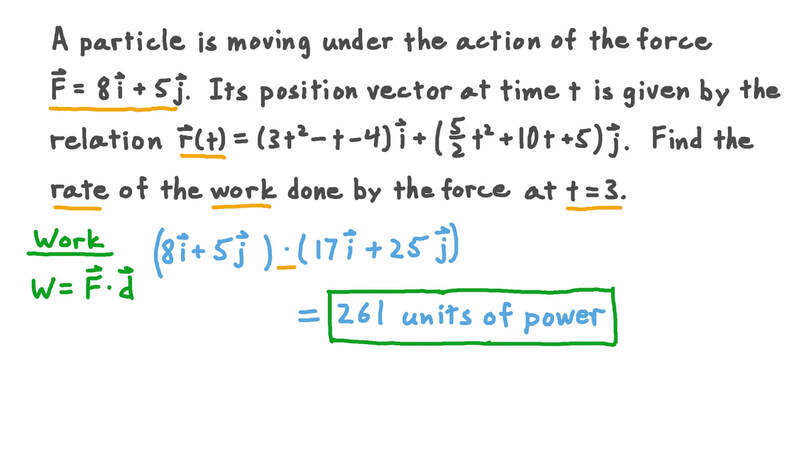 A body of mass 5 kg is moving under the action of the force F measured in newtons. Its position vector after 𝑡 seconds is given by r i j =  9 𝑡 + 8 𝑡  .   m Find the work done by the force F over the interval 0 ≤ 𝑡 ≤ 1 . A particle of mass 2 g is moving under the action of two forces ⃑ 𝐹 1 and ⃑ 𝐹 2 , where ⃑ 𝐹 =  − 2 ⃑ 𝑖 + 3 ⃑ 𝑗  1 d y n e s and ⃑ 𝐹 =  − 4 ⃑ 𝑖 − 7 ⃑ 𝑗  2 d y n e s . The position vector of the particle is given as a function of time by ⃑ 𝑟 ( 𝑡 ) =   𝑎 𝑡 − 1  ⃑ 𝑖 +  𝑏 𝑡 − 2  ⃑ 𝑗  2 2 c m , where 𝑎 and 𝑏 are constants. Determine, in ergs per second, the power at which the resultant force acts on the particle 6 seconds after the start of motion. A body of mass 2 kg moves under the action of a force ⃑ 𝐹 N. At time 𝑡 seconds, the velocity of the body is given by ⃑ 𝑣 =  ( 2 + 4 3 𝑡 ) ⃑ 𝑖 + ( − 2 + 4 3 𝑡 ) ⃑ 𝑗  / s i n c o s m s . Find, in terms of 𝑡 , the power of the force, ⃑ 𝐹 . A body of mass 4 kg moves under the action of a force ⃑ 𝐹 . Its position vector at time 𝑡 is given by the relation ⃑ 𝑟 ( 𝑡 ) =  8 𝑡  ⃑ 𝑖 +  5 𝑡  ⃑ 𝑗 3 2 . Given that 𝐹 is measured in newtons, 𝑟 in metres, and 𝑡 in seconds, write an expression for the power of force ⃑ 𝐹 at time 𝑡 . A particle of unit mass is moving under the action of a force ⃑ 𝐹 = ⃑ 𝑖 + 5 ⃑ 𝑗 . Its displacement, as a function of time, is given by ⃑ 𝑆 ( 𝑡 ) = − 7 𝑡 ⃑ 𝑖 +  5 𝑡 − 𝑡  ⃑ 𝑗 2 . Find the value of 𝑑 𝑑 𝑡  ⃑ 𝐹 ⊙ ⃑ 𝑆  when 𝑡 = 4 . A constant force ⃑ 𝐹 , measured in dynes, is acting on a body. The displacement of the body, after 𝑡 seconds, is given by ⃑ 𝑟 ( 𝑡 ) =  𝑡 ⃑ 𝑖 − 5 𝑡 ⃑ 𝑗  2 c m , where ⃑ 𝑖 and ⃑ 𝑗 are two perpendicular unit vectors. Given that the force ⃑ 𝐹 was working at a rate of 71 erg/s when 𝑡 = 7 , and at 31 erg/s when 𝑡 = 2 , determine ⃑ 𝐹 . A constant force ⃑ 𝐹 , measured in dynes, is acting on a body. The displacement of the body, after 𝑡 seconds, is given by ⃑ 𝑟 ( 𝑡 ) =  2 𝑡 ⃑ 𝑖 − 6 𝑡 ⃑ 𝑗  2 c m , where ⃑ 𝑖 and ⃑ 𝑗 are two perpendicular unit vectors. Given that the force ⃑ 𝐹 was working at a rate of 6 erg/s when 𝑡 = 6 , and at 14 erg/s when 𝑡 = 7 , determine ⃑ 𝐹 . A body of mass 3 kg is moving under the action of the force F measured in newtons. Its position vector after 𝑡 seconds is given by r i j =  6 𝑡 + 5 𝑡  .   m Find the work done by the force F over the interval 0 ≤ 𝑡 ≤ 1 . A body of mass 8 kg is moving under the action of the force F measured in newtons. Its position vector after 𝑡 seconds is given by r i j =  2 𝑡 + 6 𝑡  .   m Find the work done by the force F over the interval 0 ≤ 𝑡 ≤ 1 .